When it comes to choosing your wedding flowers, the options to consider are nearly endless, from the design and theme, to the colour and types of flowers. Hiring a professional florist is a great way to get wedding flowers sorted, but it’s also a good way to add even more to an already runaway wedding budget. Another option that can help to shrink the wedding budget is to DIY your wedding flowers. You can choose to do all of the flowers yourself or just the basics like bouquets and boutonnieres. Our Guide will show you the best ways to create beautiful do-it-yourself wedding flowers from start to finish, and everything in between. Creating flowers for your wedding doesn’t have to be hard, and it’s even easier if you have a couple more pairs of willing hands. Make smart use of your friends, family members, and especially members of the bridal party. Try setting up a girls’ night around the table with a few drinks, some music, and snacks. Simplistic floral arrangements using seasonal and local flowers are becoming more popular, which is especially great news for DIY-ers. You see, a florist’s job is not easy, they have a lot of skill and creativity. But with the right mix of simplicity and style, you can easily create some of your own beautiful standout floral arrangements. A unique opportunity to inject your personality and style into your wedding arrangements. Saving money on the labour. The absolute satisfaction that you did it with our own two hands. Complete and total control over your wedding flowers. From planning your wedding flowers to gathering all the supplies, to receiving proper instruction and the actual creation of them, this guide has you covered. First up you are going to see the mistakes that other people have done with their flowers, which will give you an excellent idea of what you want to avoid. DIY wedding flowers are not for everyone and can become overwhelming and stressful if you do not plan it out in advance or take on too much with too little time. Depending on your level of experience and whether or not you’re a laid back bride, you may end up loving the process of making your wedding flowers. Regardless, as long as you have a few helpers and block off at least 7 hours depending on the number of arrangements, you should have enough time. Another important trick is to know your limits and stick to them. Do not overexert yourself. If you know your limits, keep it simple and plan ahead, then making your wedding flowers can be very exciting. Remember that you do not have to do all the flowers yourself, you have the option of just doing the smaller stuff and leave some of the bigger, more intricate pieces to the professionals. Made their own wedding flowers: was it worth it? Well, it looks like the previous chapter did not put you off and you are still with us, so a very hearty welcome aboard! In this section, you will find some inspiration from real life weddings, and if you do not already have the central theme in mind, then you will begin to have an idea of how you would like your wedding to look. You’ll find some creative ways to use flowers and garlands to cover up ugly tent poles, create 3D floral backdrops (for wedding photos perhaps? ), not to mention a few modern twists on some of the old wedding traditions. Anniversary piñatas and hangover helper kits for party favours, anyone? Inspiration Gallery: filter by theme, colour, and category. You can never have enough ideas! If you’re not sure where to begin – or seeking to brush up on the basics – these resources will help you get your wedding budget off to the right start. You’ll learn how to plan your whole wedding budget (not just the flowers), which will give you peace of mind when it comes to your actual wedding day. Did you know that the venue, food, and alcohol usually take up the most of a wedding budget, followed by clothing and accessories, then photography and videography, and then flowers and decorations? As you go about setting your wedding budget, remember that the hard part isn’t setting a budget, it’s sticking to it. Weddings on a small budget: Actual small budget wedding examples. How to plan your complete wedding. Ok so if you have been through the third chapter then you should already have an idea of how much money you will have available for your flowers and maybe a theme. This next chapter will help you choose the right type of flower arrangements for your wedding. Depending on the location of your wedding, you’ll have various local and seasonal options to choose from. Consider your wedding colours and, if you’re struggling to narrow down your flower selection, choose what type of flower arrangement and centrepieces to use. Another thing to consider is your décor and the size of your venue. If your ceremony and reception venue already provides stunning floral arrangements, you may not need to invest as much in flowers. Questions to ask your florist if you want to share the load. You should now have a budget and wedding theme sorted. Time to get down to the fun part: shopping. 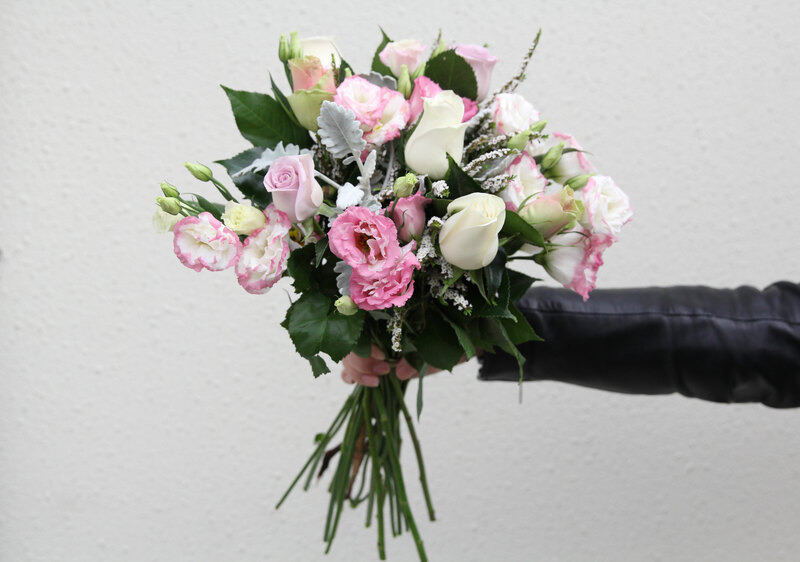 There are plenty of places to buy your flowers from, and if you have allowed enough time, then you will be able to shop around and get the best price to suit your budget. Your local florist is the ideal place to go as they have will have the best information on flowers. Avoid the cheap flowers from the supermarkets, they are often weeks old. Other options to consider are the farmer’s markets or go straight to the source, Flower Farms or even grow your own! This chapter is where the magic happens; this is where you will learn how to make your floral arrangements, step by step! Gorgeous rustic bridal bouquets, gypsy-chic colourful crowns, handcrafted boutonnieres for the groom and his men – if you can think it, you can make it. It just takes patience, the right materials and time. Remember, “many hands make light work,” so when you’ve gathered everything that you need and are ready to start making stuff, call on your friends and family. Nothing kills wedding flowers like heat. Conditioning your cut flowers will help to extend their life, as will keeping them in a nice cool room until the very last moment. To get the most out of your cut flowers and to avoid damaging them while they are stored and transported you will need to follow a few rules. From milk crates and paint cans to dish racks and more, we’ve got every transportation trick of the trade for your wedding flowers, no matter their size or container shape. Once they are all put together, you will still need to get them to the venue/s, so plan ahead, make sure you have enough time to get to the venue, room in the vehicles and buckets or boxes in which to place them. How to get them to your venue without destroying them. If you haven’t already thought about this yet, you should consider reusing your wedding flowers in the reception. There is no reason to let those lovely buds and arrangements that you worked so hard on go to waste. Don’t forget to put a container for the bridal bouquet on your table. Once the wedding flowers are no longer required, you might want to let family and friends take them home as thank you gifts. You can organise to drop them off at a hospital or Aged Care Facility, or save a few of your own to dry, press, and keep as a reminder of your special day. Thank you for sharing this on your blog. DIY wedding flowers are indeed great compared to those ready-made wedding flowers. It is more customise, more love put onto the blossoms which make it more special. Plus, you can design based on what you really want.. Overall, thank you for this mate. Thank you so much for sharing. This looks great. The flowers are looking very gorgeous and pretty. Really cool idea for wedding flowers.I Really liked this post. Thank you so much for sharing. Thank you so much for sharing some very useful tips on through this blog. It is not always possible to get the perfect wedding flower bouquets from the local florists. Therefore, your tips will surely help me making a customised wedding flower bouquet myself.